MAGINI, G. A. 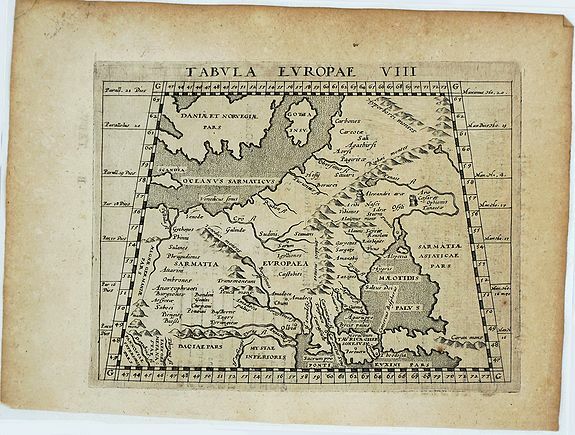 - Tabula Europe VIII. Arnhem, 1597, Uncoloured. 135x176mm. In good condition. Slightly browned and foxed. Paper with original map maker’s watermarks. 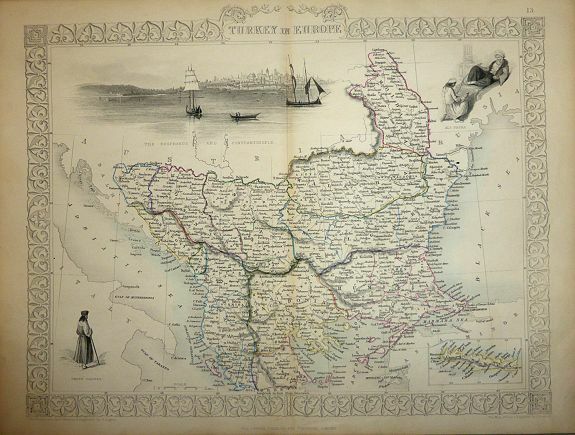 A very attractive copper engraving map of Western Sarmatia, now Poland, Lithuania, Scandinavia, Ukraine and Russia. 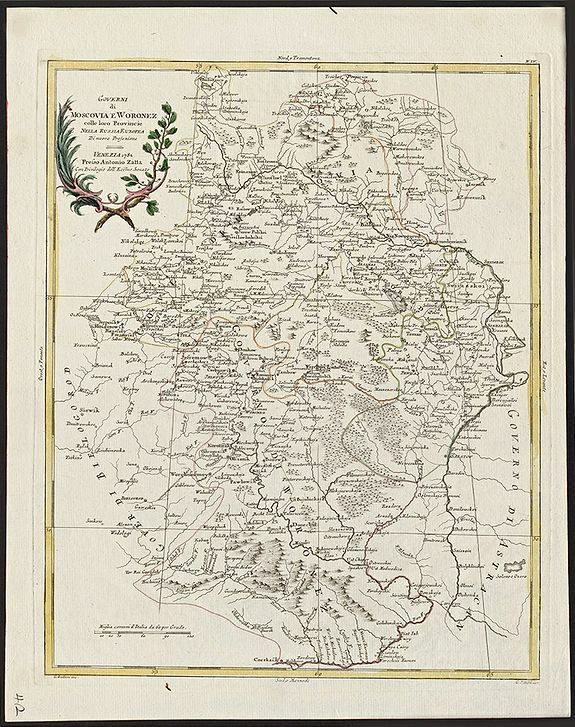 BLAEU, W. - Campus Inter Bohum et Borystenem. . .
Amsterdam, 1638, Contemporary coloring. 325x755mm. In very good condition! Wide margins. Several brownish areas on margin. Few small marginal splits professionally restored. 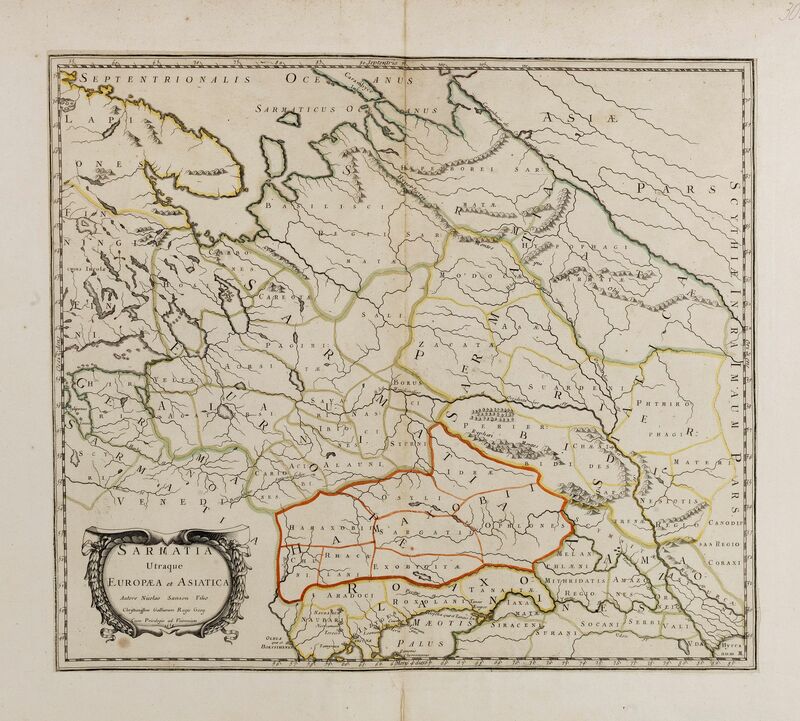 HONDIUS, H. - Novissima Russiae Tabula. Amsterdam, 1645, In original colours.. 470x554mm. Paper slightly age-toned. Repair of a small split in lower part center fold. A good and dark impression. Detailed map of Russia including Scandinavia. Bottom left title cartouche and dedication. 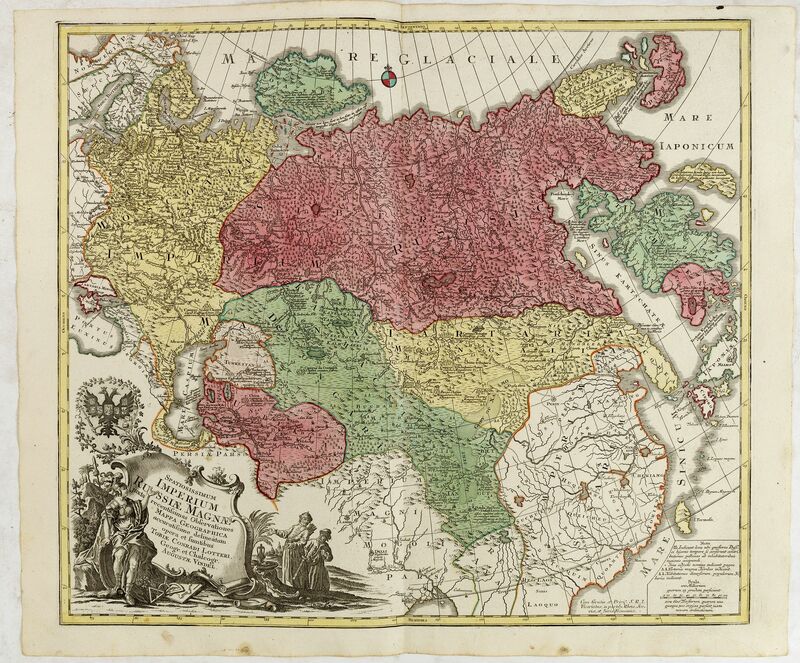 BLAEU, J. - Tractus Borysthenis vulgo Dniepr et Niepr Dicti, A Civitate Czyrkassii as ostia et Ilmien lacum, per quem in Pontum Euxinium se exonerat . . .
Amsterdam, 1662, Coloured. 385x547mm. In very good condition, wide margins. Few brownish spots on margin. 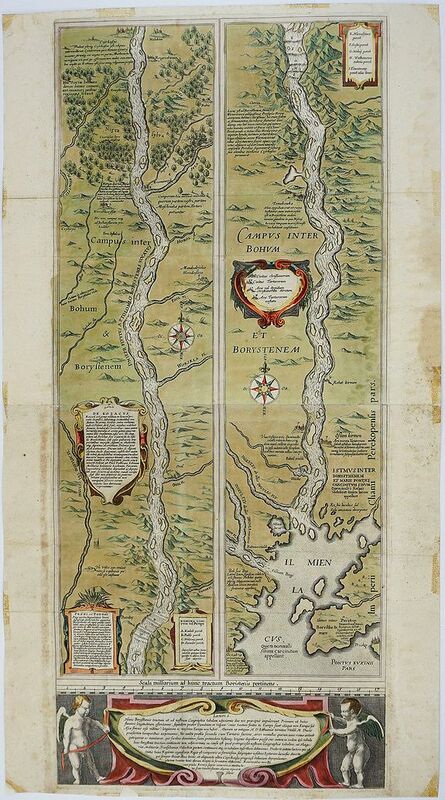 This superb map shows the upper part of the Dnieper River in two horizontal strips, the upper map with a compass rose orienting the map, west to the top. It is richly embellished with an elaborate title cartouche surrounded by hunters. Animals adorn the distance scale cartouche. Venice, 1695, Uncoloured.. 605x458mm. Some light mainly marginal water stains, generally in good condition. Dark impression. MOLL Herman. 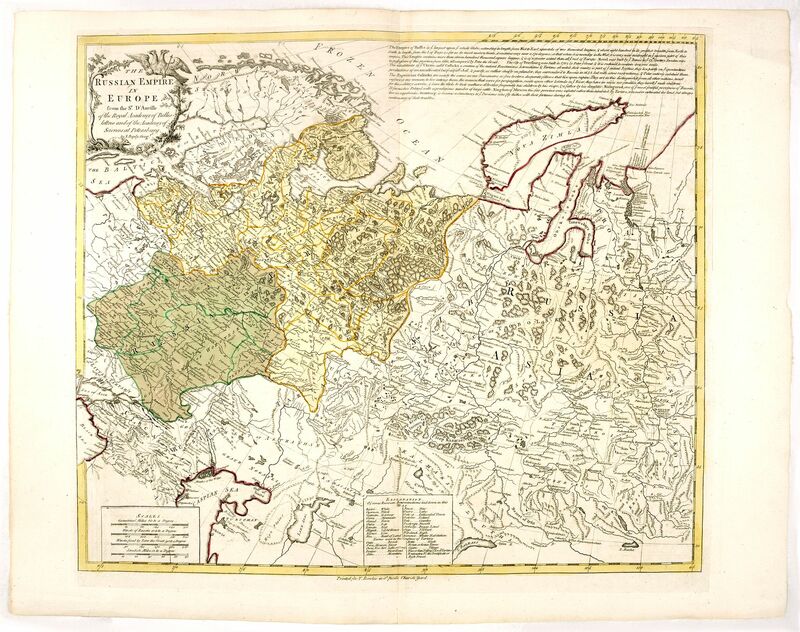 - The Dominions of Moscovy or Russia. 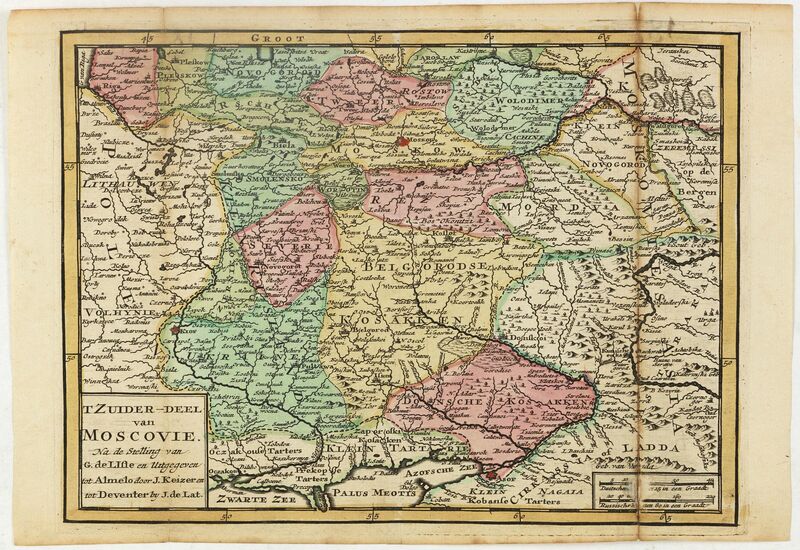 . .
London, 1711, Faint outline colouring . 180x253mm. Lightly age toned. Original folds flattened with wide margins. 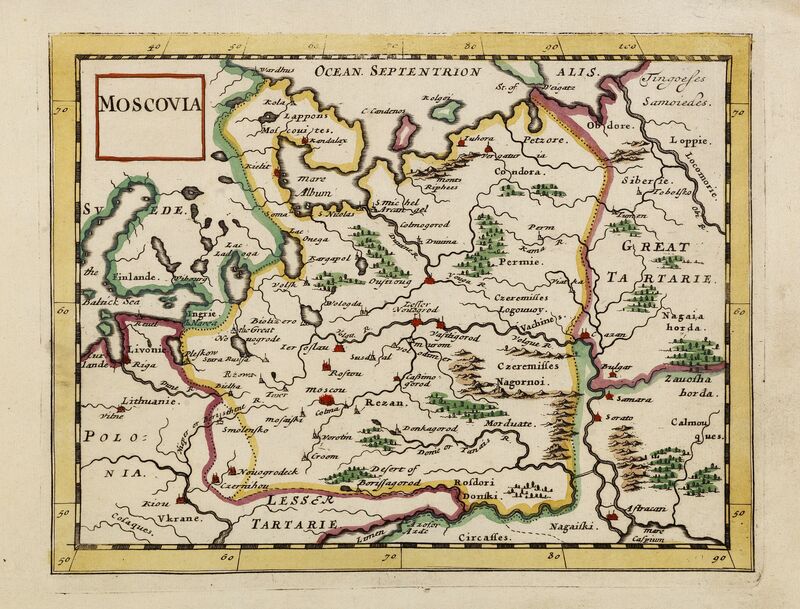 MOLL, H. - Map of Moscovy, Poland, Little Tartary, and ye Black Sea &c. . .
London, 1716, Coloured. 620x995mm. In very good condition. Two joined sheets. A magnificent large-scale, English map of Russia, Ukraine, Poland, Finland and the Baltic Countries and extending south to the Black Sea and the Balkans, with an ornate dedication cartouche to Peter the Great, including a portrait of the Czar near the bottom of the cartouche. 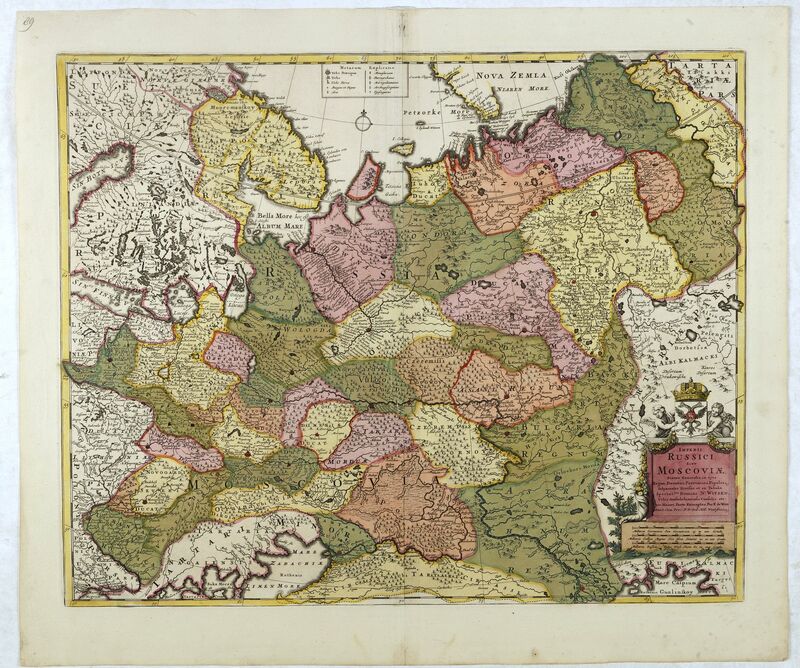 LOTTER, T. C. - Spatiosissimum Imperium Russiae Magnae juxta recentissimas Observationes Mappa Geographica . 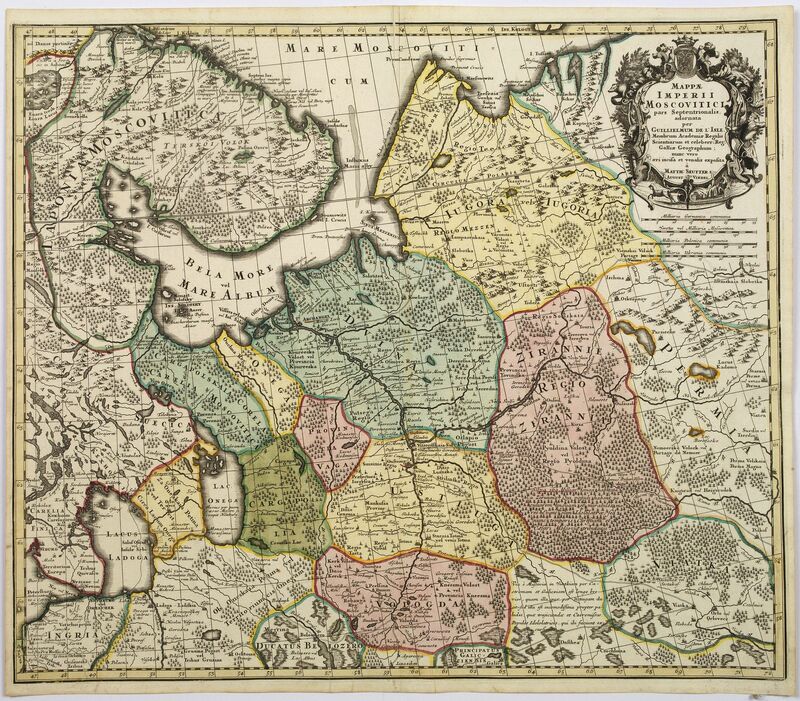 . .
Augsburg, 1757, In attractive strong original colours.. 500x570mm. Mint condition. Printed on heavy paper. 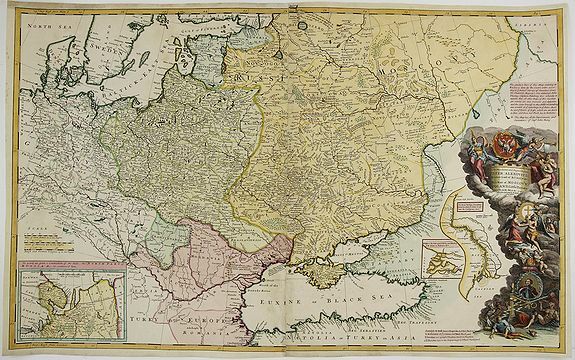 Decorative map of greater Russia, extending from Livonia in the west to Kamchatka, China, Tibet, Taiwan, Korea and part of Japan in the east. To the south it runs from Georgia (not shown as part of Russia) across the Caspian and Uzbekistan. Venice, 1781, Strong original colours.. 420x320mm. Very good condition. 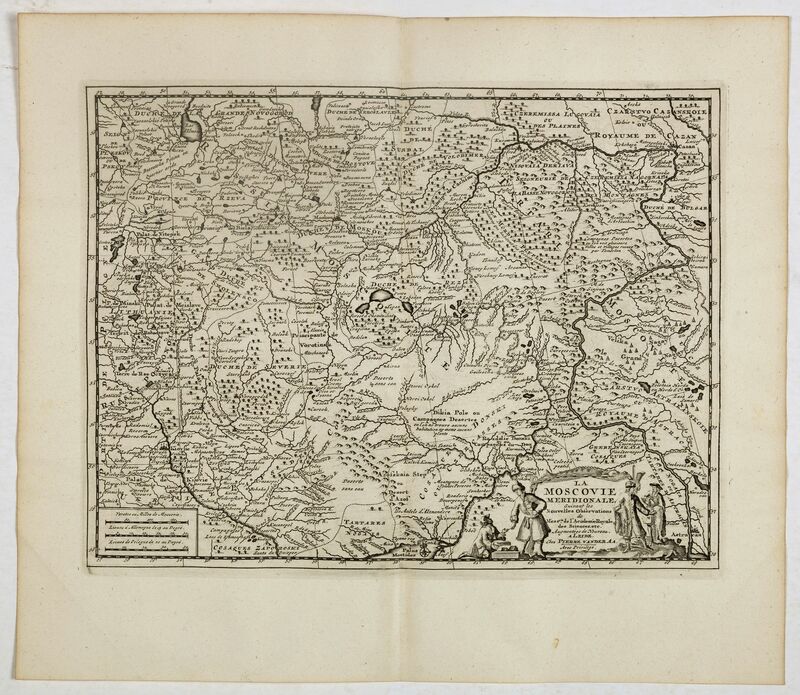 BOWLES, T. - Russian Empire in Europe from the Dr. D'Anville of the Royal Academy. . .
London, ca. 1782, In original colours.. 478x560mm. In very fine to mint condition. 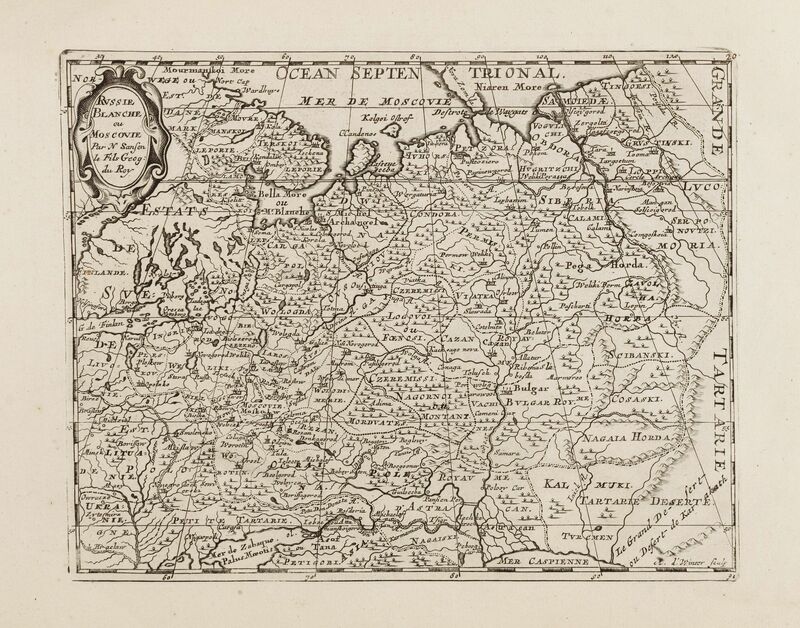 Rare map of Russia, prepared by John Bayly (active 1755-1794) after D'Anville. In the lower left corner parts of the Caspian and Black Sea. In upper right corner Nova Zembla with a dotted southern coast line. ZATTA, Antonio - Governo di Arcangelo, e sue Provincie Nella Russia Europea. Venice, 1782, Strong original colours.. 420x320mm. Very good condition. The nice map depicting vast territory of present days the Northern part of Russian Federation and those days territory of the Russian Empire. ZATTA, Antonio - Governi di Moscovia E Woronez colle loro Provincie Nella Russia Europae. 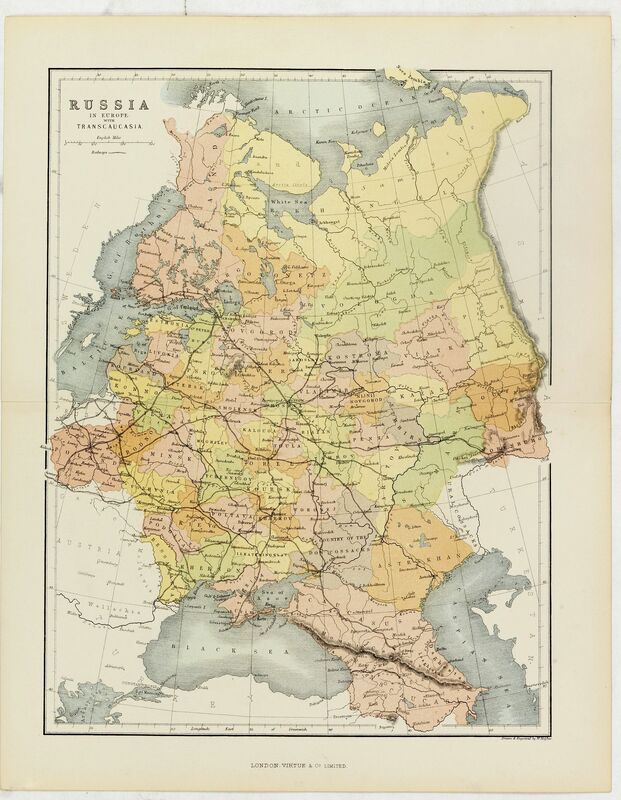 The nice map depicting vast territory of present days the Central part of Russian Federation and then the Russian Empire. 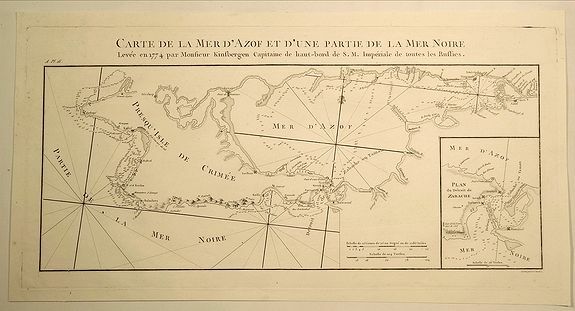 TARDIEU, P. - Carte de la Mer D’Azof et D’Une Partie de la Mer Noire. Paris, 1783, Uncoloured.. 215x450mm. In very fine condition. Engraved map of the Crimean Peninsula with the Black Sea and the Sea of Azov in Russia. From the Atlas Volume of "Histoire physique, morale, civile et politique de la Russie Ancienne" by N. G. Le Clerc. Engraved by P. F. Tardieu. This item has no reserve price. VON REILLY, F.J.J. - Karte von dem Russischen Reiche in Europa . . .
Vienna, 1796, In original o/l colours.. 560x750mm. In very good condition, printed on heavy paper. 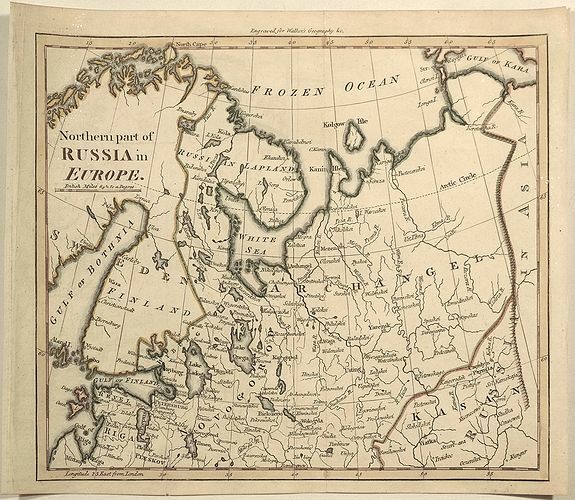 An attractive large map of European Russia, including Finland. Very detailed with rivers lakes mountains etc. 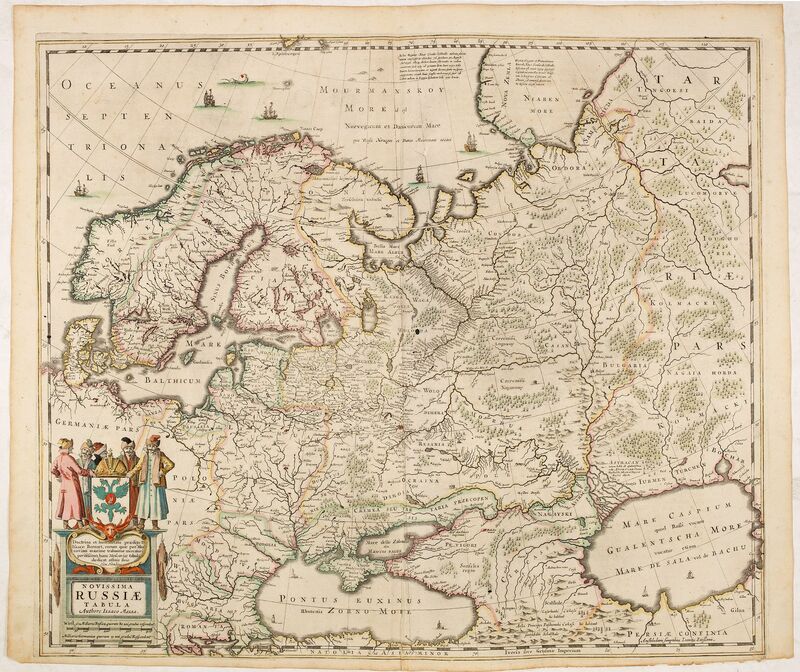 Russia with a decorative title cartouche in the upper left-hand corner. Engraved by Franz Muller. Brion de la Tour, L. - Carte de la Partie Septentrionale de la Russie Euopéenne. Paris, 1790-1798, later colouring. 220x304mm. very good condition. Louis Brion de la Tour (1756-1823), French geographer. '' 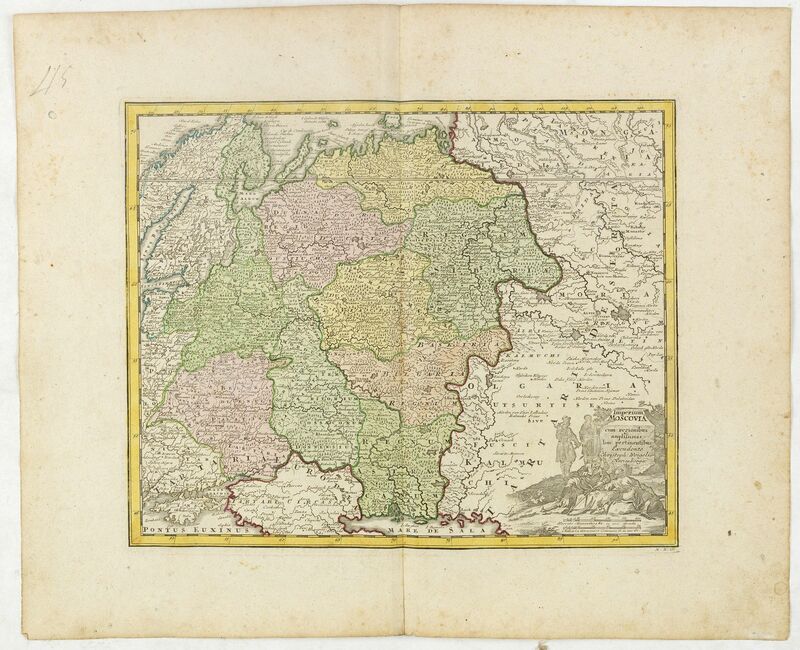 Atlas Géneral, Civil et Ecclésiastique'', 1766, '' Atlas Général'', 1790-98.A nice small map of European Russia. BARLOW, James - Muscovy or Russia in Europe. Bungay, 1806, Original colours.. 360x215mm. 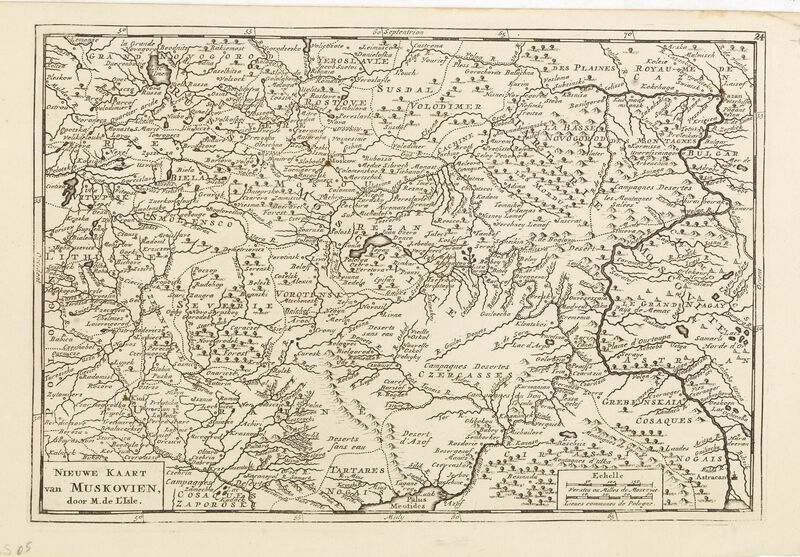 The map is in good condition with two original folds that will flatted. Wide margins the sheet size is 260 x 395 mm the printed area approximately 215 x 360 mm. THOMSON, John. 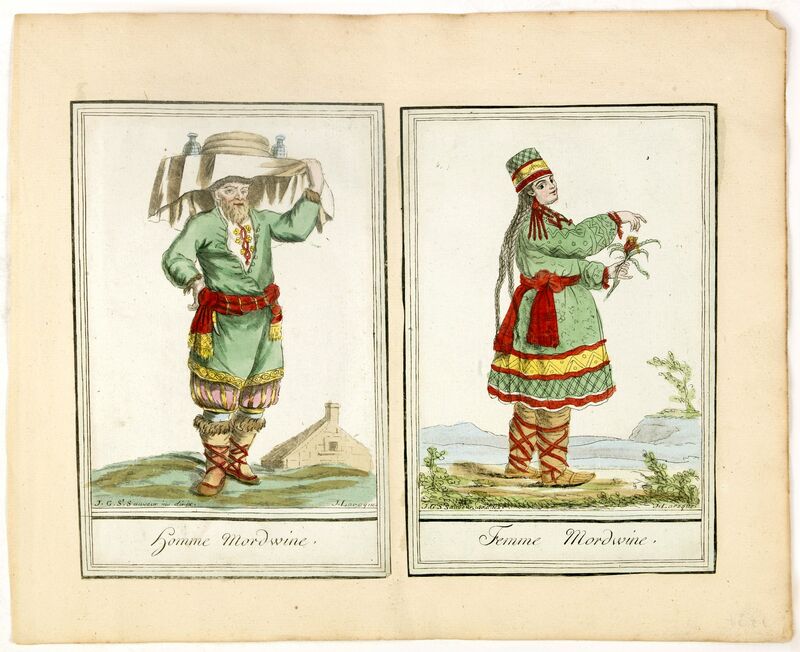 - European Russia. Edinbourgh, 1815, Original Colour. 600x500mm. In fine condition with centrefold as issued. 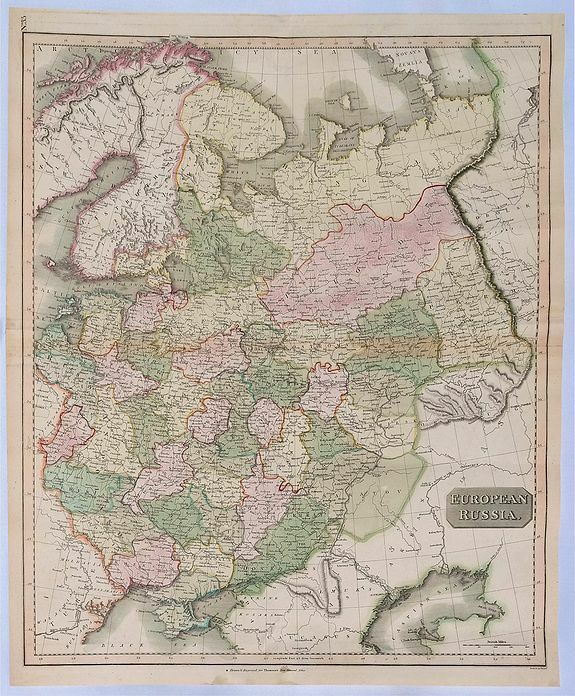 An attractive large format copper engraved antique map of Russia in Europe covering present day Ukraine, Belarus, Latvia, Lithuania, Estonia and Western Russia eastwards to the Ural Mountains. Thomson maps are known for their stunning color, awe inspiring size, and magnificent detail. John Tallis, John Rapkin - Turkey in Europe. London, 1858, Original outline colouring. 260x330mm. In good condition. A highly detailed and decorative map of European Turkey bordering the Black Sea and surrounding countries with three vignette illustrations. HUGHES, W. - Russia in Europe with Transcaucasia. London, 1880, In original printed colours.. 310x225mm. In very good condition. 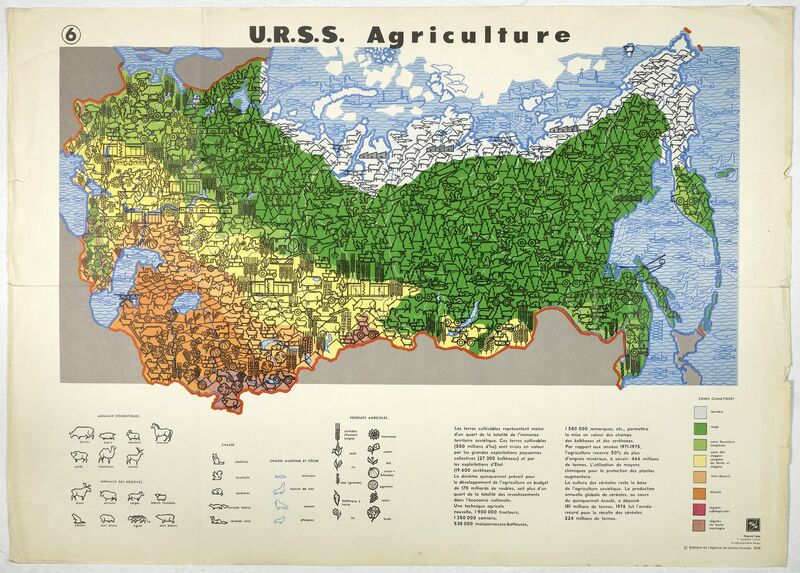 USSR, 1978, Coloured.. 670x480mm. Some old folds, margins a bit frayed, generally in good condition. Map of Eastern Russia. Propaganda poster for Russia's industry. Text in French. Editions de l'Agence de presse Novosti". 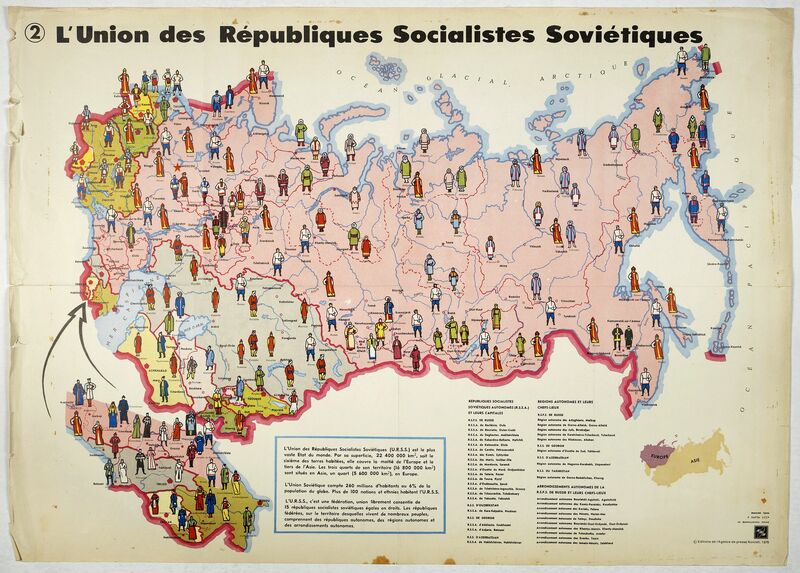 USSR, 1978, Coloured.. 480x670mm. Some old folds, margins a bit frayed, generally in good condition. Map of Russia. Propaganda poster for Russia's in and export of industrial goods. With a key in bottom. Text in French. Editions de l'Agence de presse Novosti". USSR, 1978, Colour printed.. 480x670mm. Some old folds, margins a bit frayed, generally in good condition. Map of Russia. Propaganda poster showing Russia' s population. With a key. Text in French. Editions de l'Agence de presse Novosti". LANGENES, B. / BERTIUS, P. - Descriptio Freti Vaigats. Amsterdam, 1606, Uncoloured.. 85x125mm. In very good condition, lightly age toned, with water stains. Wide margins, a nice dark impression. Latin text to verso. 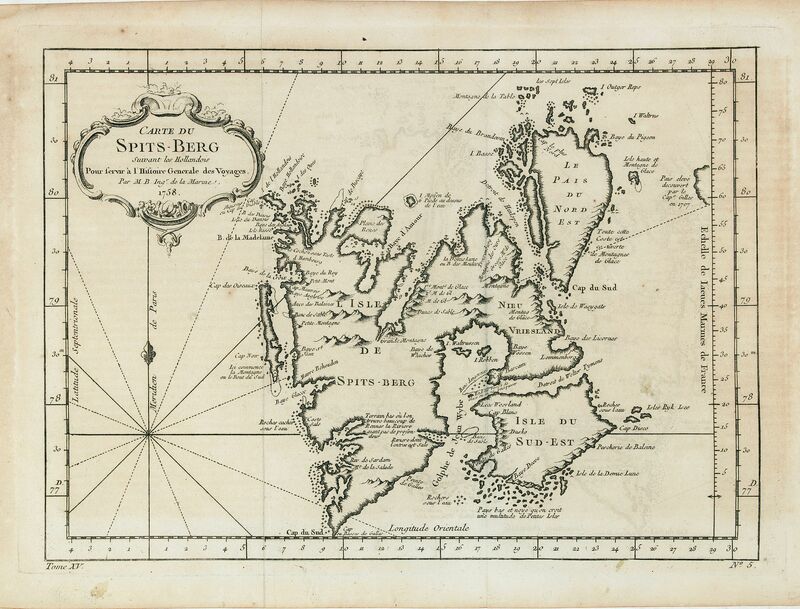 Finely engraved map of the Vaigach Straits, from Bertius's rare miniature atlas. 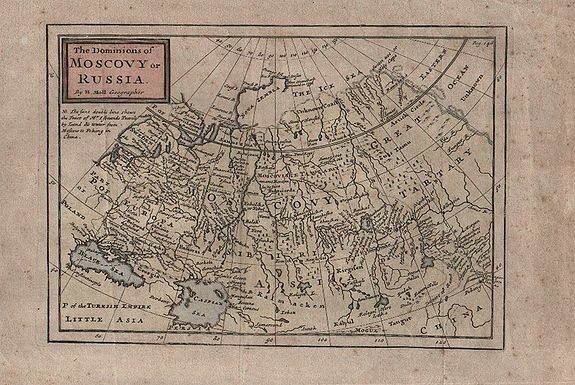 The map focuses on the straits between Novaya Zemlya and the Russian mainland, which had been discovered by western Europeans during their search a northern passage to Asia. Amsterdam, ca. 1625, Coloured.. 143x172mm. Good and dark impression. 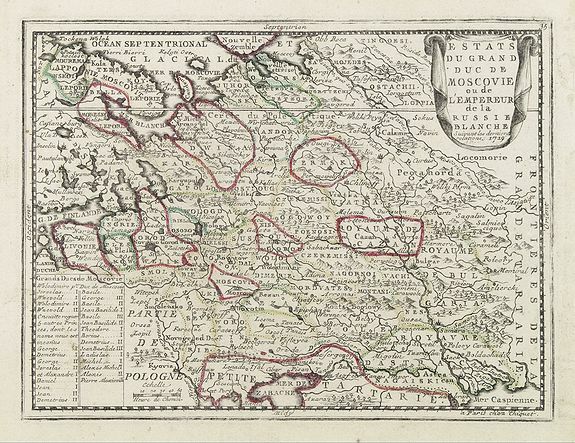 BLAEU, J. / C. - Russiae vulgo Moscovia pars australis. . .
Amsterdam, 1650, In original colours.. 385x526mm. Very good condition. French text on verso. SANSON, N. - Sarmatia utraque europaea et asiatica. . .
Paris, 1654, In original o/l colours.. 410x470mm. Cut to neat line and contemporary added margins to fit in composite atlas. Paper very slightly age toned. Dark impression. 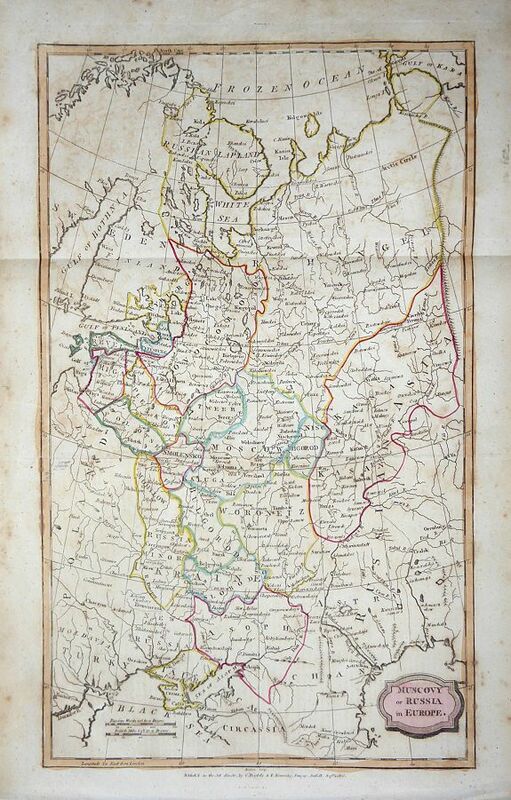 Ancient map of the European part of Russia with the Ukraine. Dated 1654. 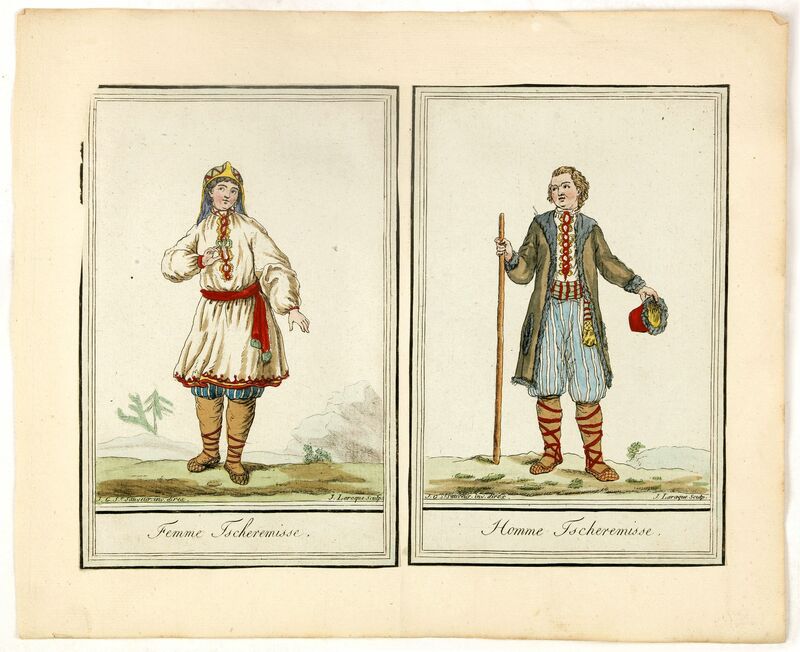 SANSON, N. - Russie blanche ou Moscovie. Amsterdam, ca. 1660, Uncoloured.. 188x240mm. In very good condition. Plano edition. 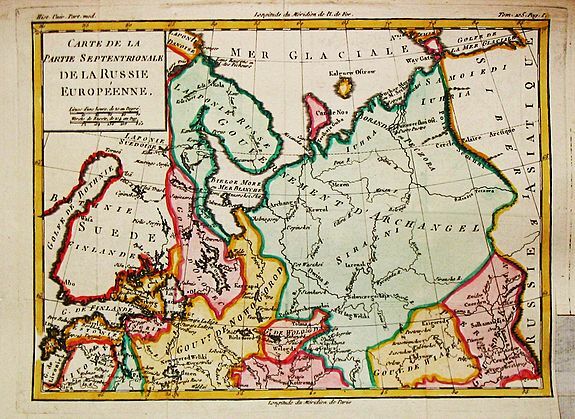 Map of the European part of Russia centered on Moscow and prepared by N.Sanson. 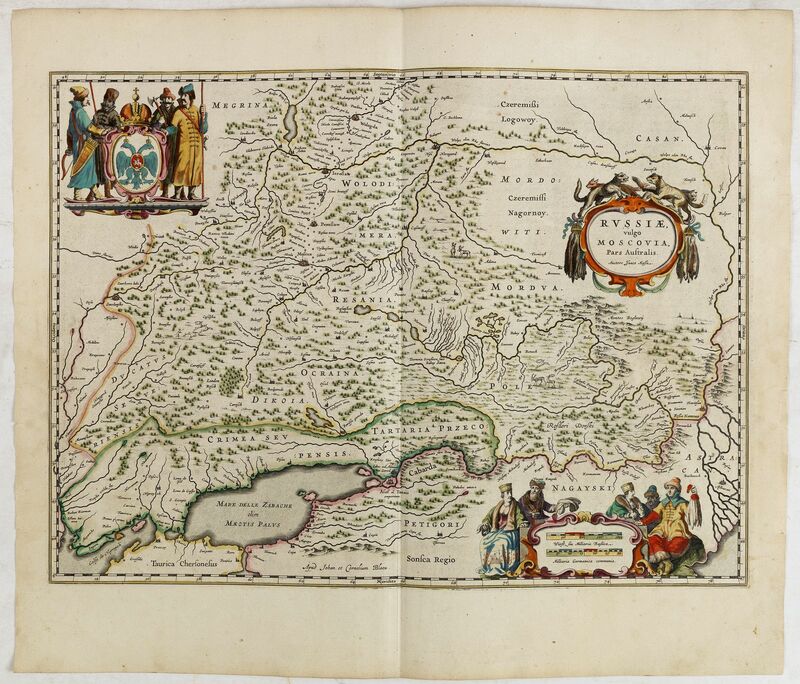 Published in an early edition of the small Sanson atlas L'Europe Dediée a Monseigneur . . . Le Tellier Secret. D'Estat &c."
DE WIT, F. - Imperii Russici sive Moscoviae . . .
Amsterdam, 1680, In attractive original colours.. 449x555mm. Printed ion heavy paper. Centerfold and a few places underlaid due to oxidation of green paint. Very good condition. France, ca. 1700, Coloured.. 160x207mm. In good condition..
MENARD, A. - Estats du Grand Duc de Moscovie ou de L'Empereur de la Russie Blanche. . .
Paris, 1711, Coloured.. 166x221mm. A good and dark impression. Printed on very heavy paper. 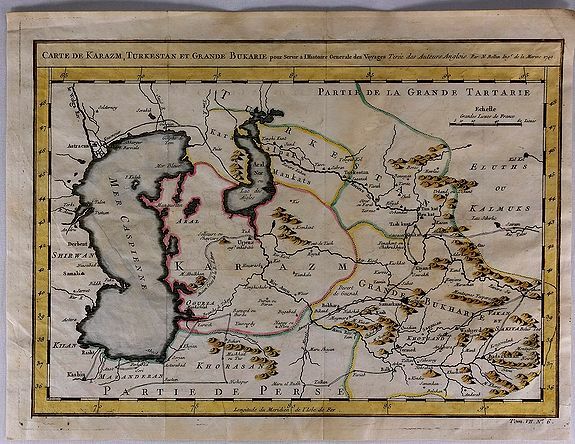 The very rare first edition published by Antoine Menard in 1711 in "Le Nouveau et Curieux Atlas géographique et historique.". 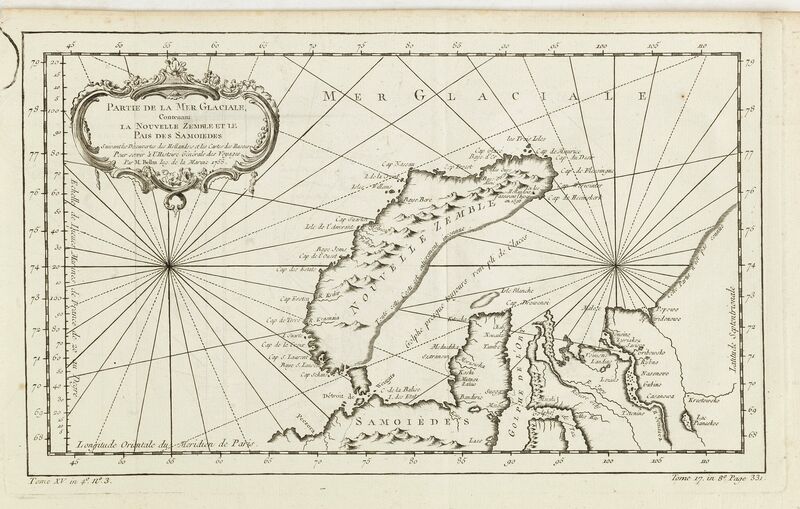 The map is more commonly found in it's later state published by Jacques Chiquet in 1719. CHIQUET, J. - Estats du Grand Duc de Moscovie ou de L'Empereur de la Russie Blanche. . .
Paris, 1719, Original o/l colour.. 166x221mm. A good and dark impression. Paper slightly age-toned. 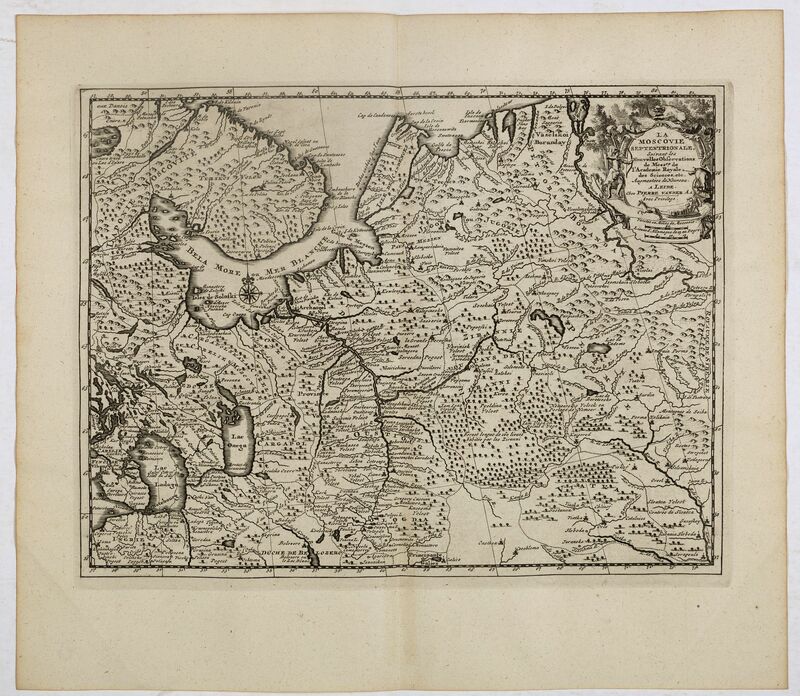 Mounted on an engraved text sheet giving an historical and geographical explanation. 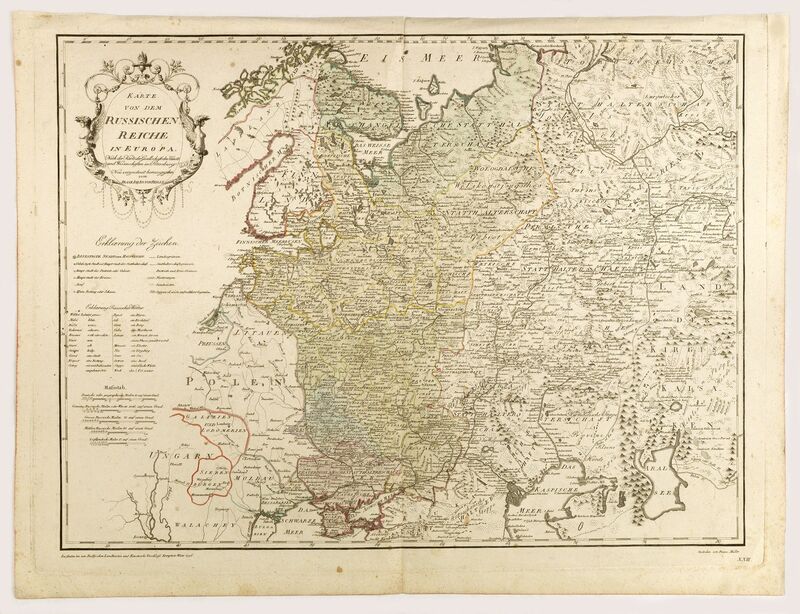 Lovely small map of central Russia with decorative title cartouche and a panel in the lower left corner listing local rulers. 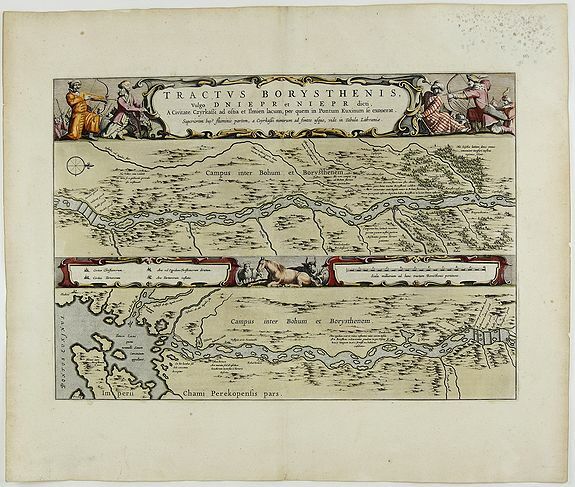 From Le Nouveau et Curieux Atlas Geographique et Historique.. by Jacques Chiquet. VAN DER AA, P. / OLEARIUS, A. - La Moscovie septentrionale . . .
Leiden, 1719, Uncoloured.. 225x295mm. Paper very slightly age toned but generally in fine condition. Dark impression. Decorative view of area north of Moscow. This well executed engraving was published in 1729 and 1727 by Pieter van der AA, in Leiden in "Les Voyages tres-curieux et tres-renommez faits en Moscovie, Tartarie et Perse." VAN DER AA, P. / OLEARIUS, A. - La Moscovie meridionale . . . Decorative map centred on Moscow. This well executed engraving was published in 1729 and 1727 by Pieter van der AA, in Leiden in "Les Voyages tres-curieux et tres-renommez faits en Moscovie, Tartarie et Perse." 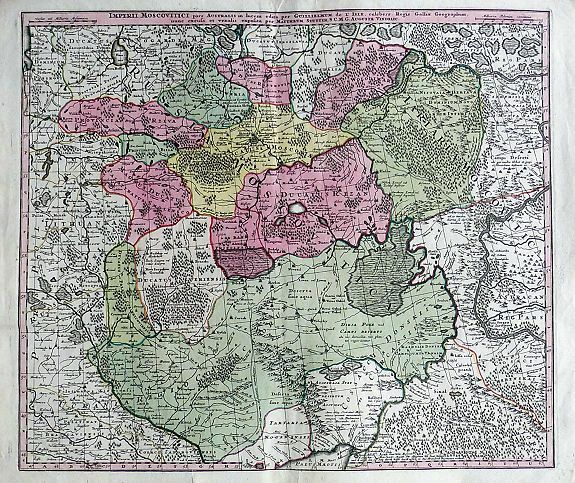 Augsburg, 1730, original colors. 500x580mm. Marginal imperfections, outside the printed area: very good condition. Nice original colours! 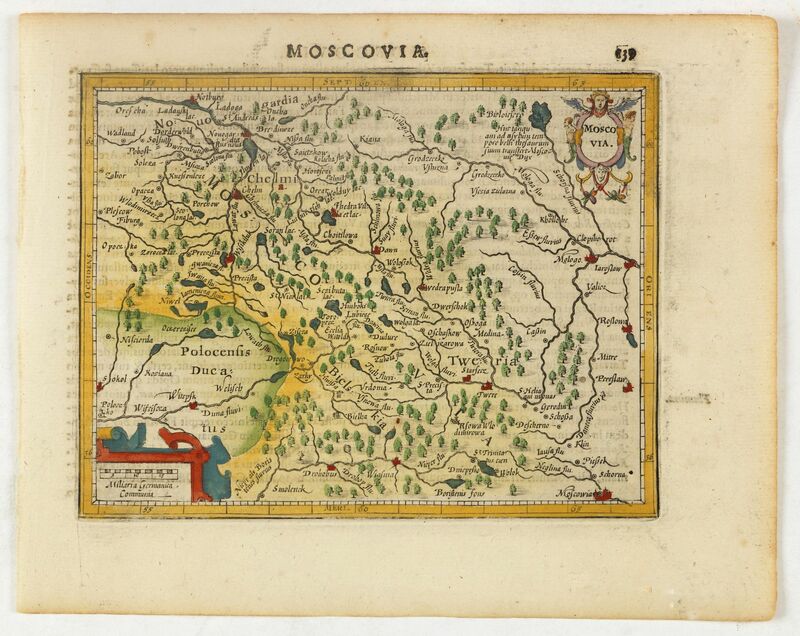 Based on the work of Guillaume de l'Isle, this large, very decorative, detailed map of the region around Moscow includes the Ukraine and Cossack regions. RATELBAND, J. - Nieuwe kaart van Muskovien door M. de l'Isle. Amsterdam, 1735, Uncoloured.. 267x178mm. In mint condition. 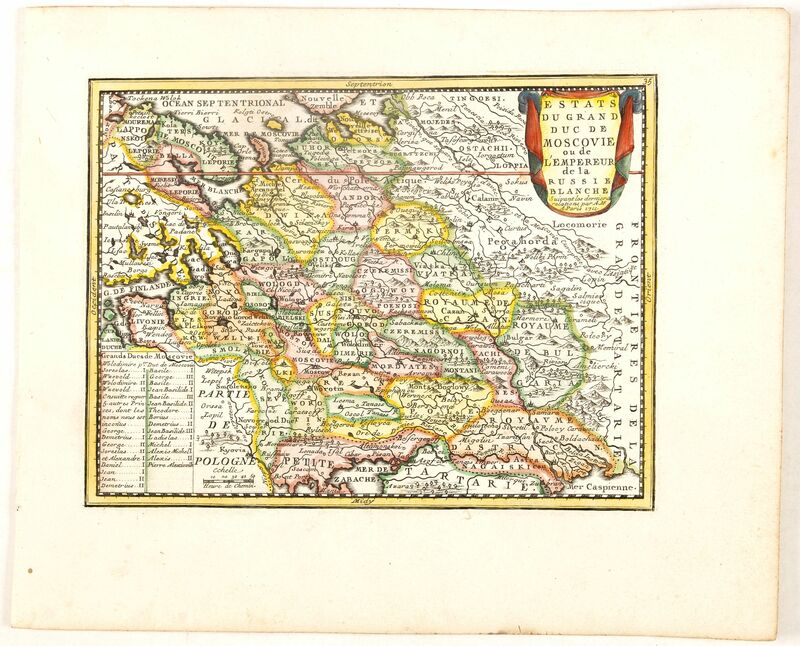 SEUTTER, M. - Mappae Imperii Moscovitici pars Septentrionalis. . .
Augsburg, 1740, In original colours.. 497x575mm. A good and dark impression. Slight paper creasing to top of centrefold, margins slim. Good condition. 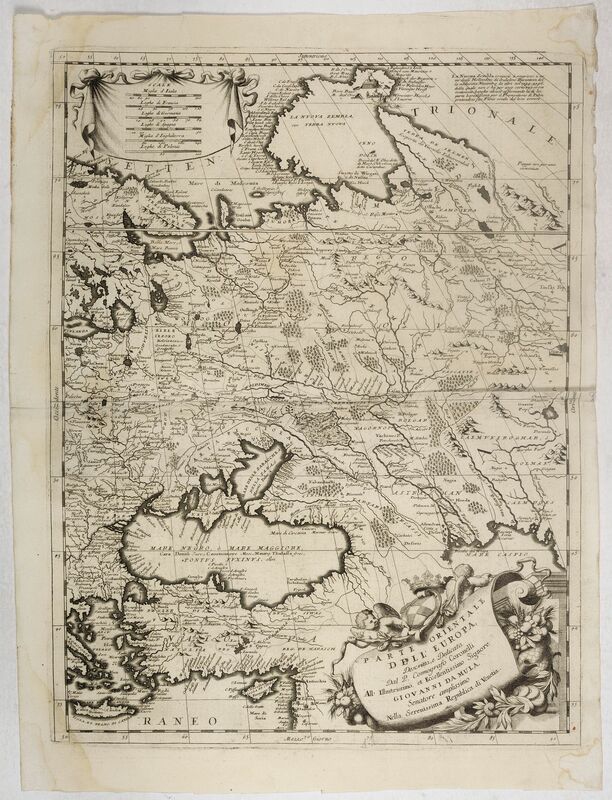 A detailed map of northern Russia embellished with an uncoloured pictorial cartouche showing hunting scenes. Good detail in Lapland, the White Sea and Archangel. St. Petersburg appears at lower left. Lakes Ladoga and Onega, the largest lakes in Europe, are prominently depicted. 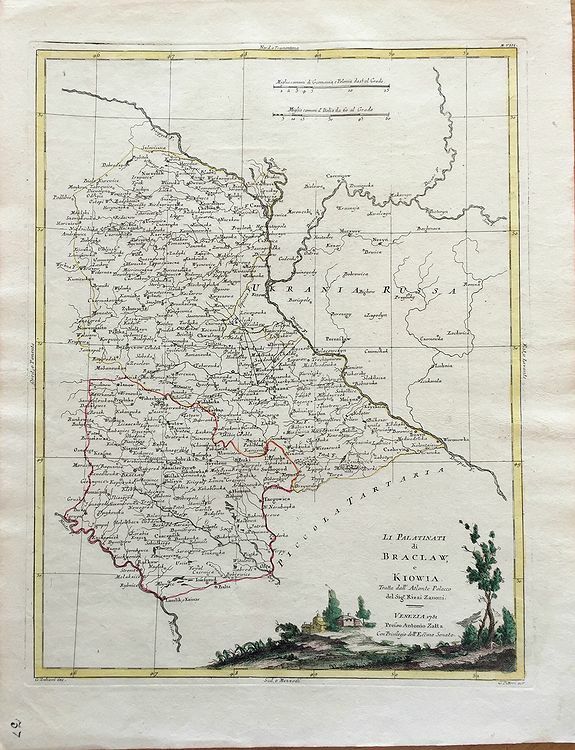 Paris, 1749, Original O/L Colours with Cartouche & Border Added. 225x310mm. In fine condition with folds as issued. The Timurids. A Central Asian Sunni Muslim dynasty, of Turko-Mongol descent, whose empire included the whole of Iran, modern Afghanistan, and modern Uzbekistan, as well as large parts of contemporary Pakistan, North India, Mesopotamia, Anatolia and the Caucasus. WEIGEL, Chr. - Imperium Moscoviae. 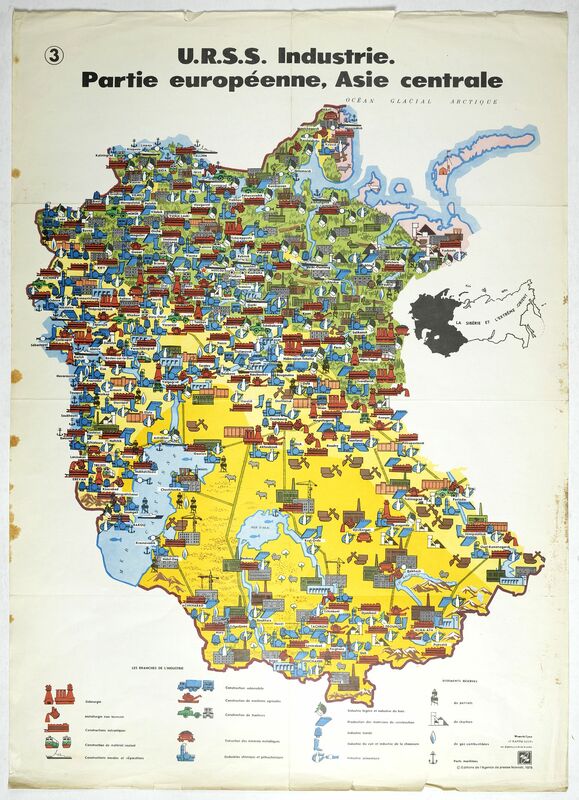 Nuremberg, 1750, In original colours.. 275x343mm. Paper slightly age toned, and spotted. Paris, 1758, Uncoloured.. 217x301mm. Paper very slightly age toned. Vertical foldings, as issued. A good and dark impression. BELLIN, J.N. 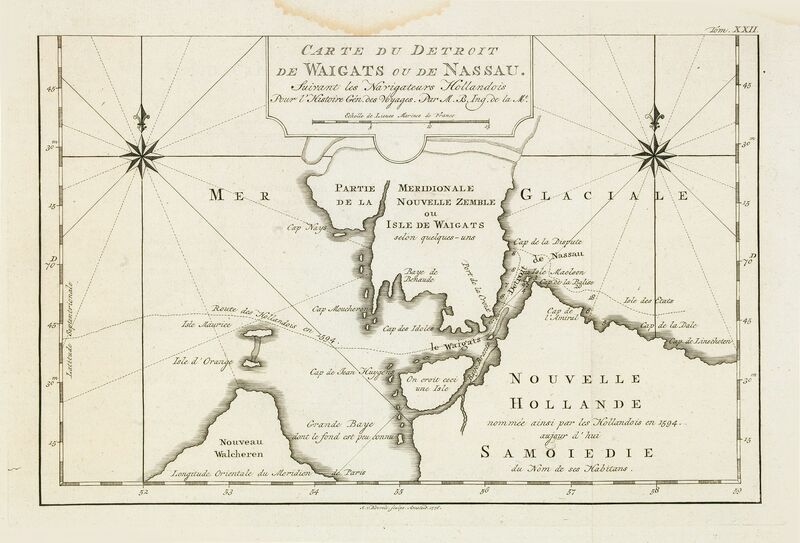 - Carte du Detroit de Waigats ou de Nassau. Paris, 1758, Uncoloured.. 192x296mm. Two marginal water stains. Vertical foldings, as issued. A good and dark impression. Showing the Dutch voyage of 1594 which proved Nova Zemlya was an island separated from the continent by the "le Waigats Detroit". Several sounding shown and one anchorage off then named Isle Maelson. Paris, 1758, Uncoloured.. 212x345mm. Vertical foldings, as issued. A good and dark impression. 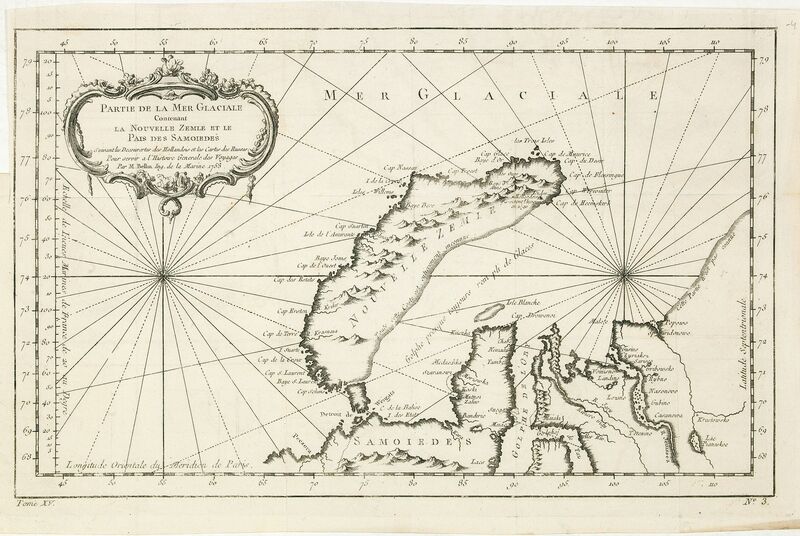 Detailed map of Nova Zembla and part of the Northeast passage. BELLIN, J.N. 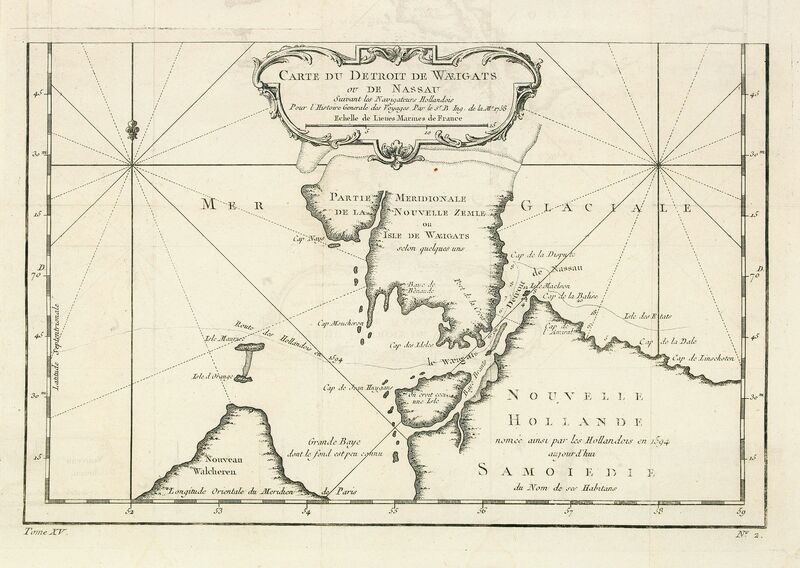 - Carte du Detroit de Waigats ou de Nassau. . . 1758. N°.2. Paris, 1758, Uncoloured.. 192x302mm. Two marginal water stains. Vertical foldings, as issued. A good and dark impression. 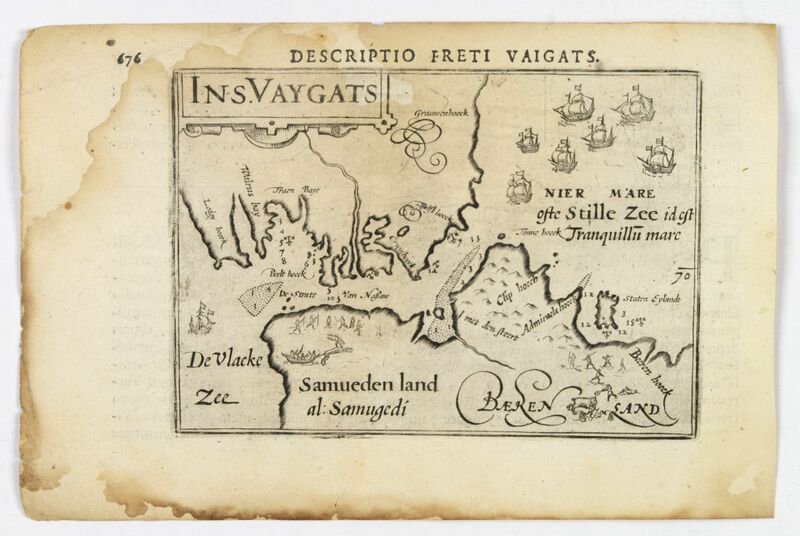 Showing the Dutch voyage of 1594 which proved Nova Zemlya was an island separated from the continent by the "le Waigats Detroit". Several sounding shown. BELLIN, J.N. 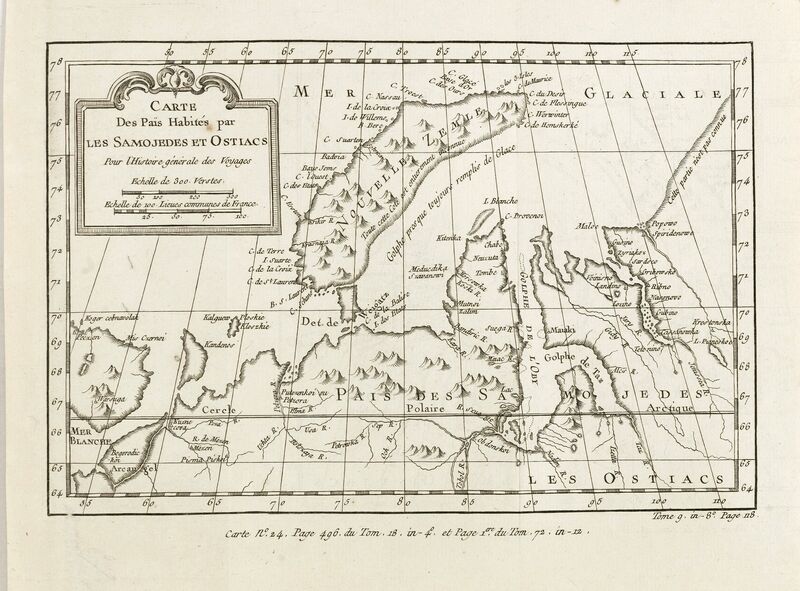 - Carte des Païs habités par les Samojedes et Ostiacs, pour l'histoire générale des voyages. Paris, 1760, Uncoloured.. 160x244mm. In very good condition. Dark impression. Map shows Nova Zembla and the area of northern Russia that was inhabited by the Samoyeds and Ostiacs. Prepared by Jacques Nicolas Bellin after Dutch sources and included in Prévost d' Exile's "Histoire des Voyages", published between 1738-1775. KEIZER, J. / DE LAT, J. - T Zuider-Deel van Moscovie. Deventer, ca 1780, In original colours.. 172x237mm. Some discolouration along vertical folds. One fold under laid. RUSSELL, J. 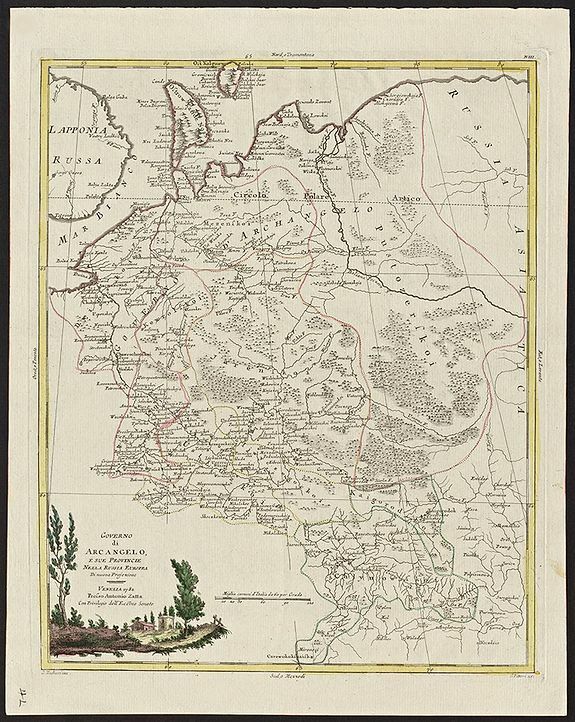 - Map of the Steppe between the Lower Volga and the Don, where the Caspian Sea was formerly united with that of Azof. London, ca 1790, Uncoloured.. 168x350mm. In good condition, folds, map may have been cleaned. Good margins, good impression. 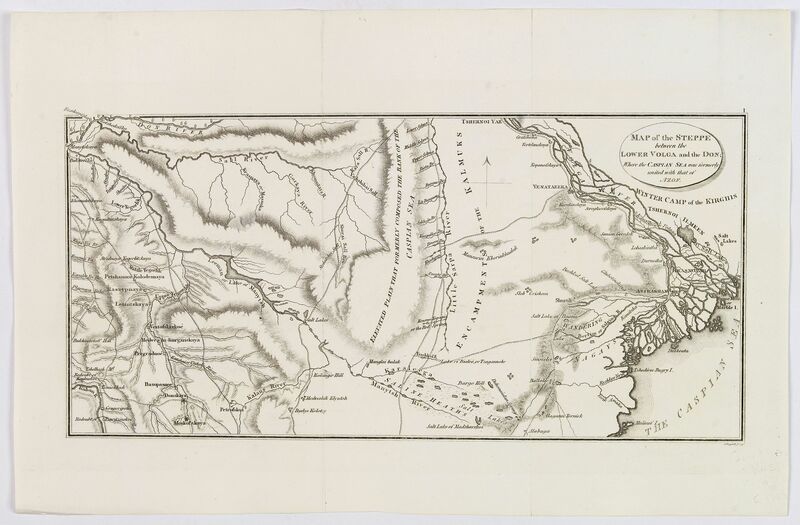 A Russian map showing the rivers Don and lower Volga flowing into the Caspian Sea. Many other small rivers and tributaries are engraved, along with places and salt lakes of the region. Astrakhan, Yenataeeka, Tshernoi Yar and Krasnoyar shown also. WALKER, J. - Northern Part of Russia in Europe. London, 1795, Attractive colouring.. 190x220mm. In fine condition. GRASSET DE SAINT SAUVEUR, J. - Homme Morwine [together with] Femme Mordwine. Paris,1801-1806, In attractive original colours.. 172x114mm. Each print (172x114mm.) cut on neat line and pasted on a larger sheet of paper. Paper size 230 x 280mm. In very good condition. 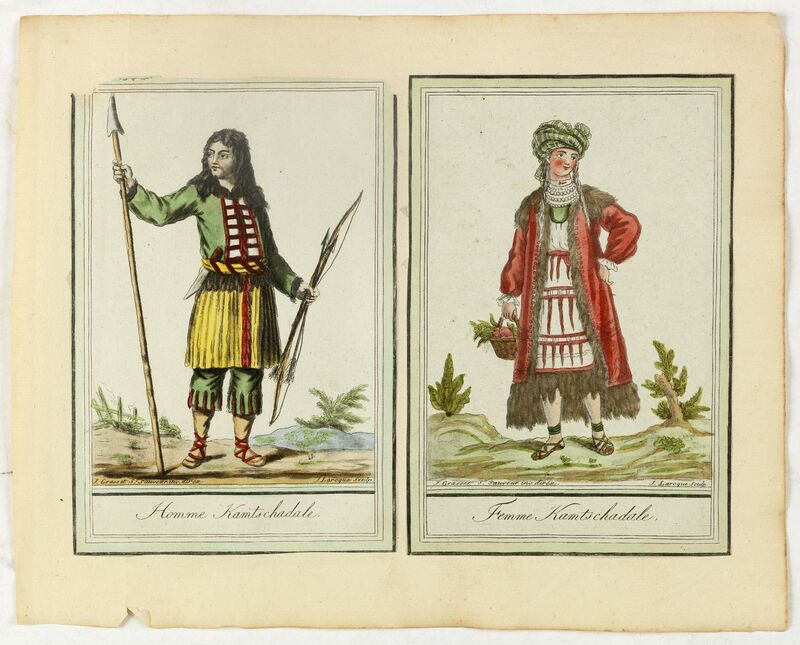 Set of two originally hand-colored mezzotints of Native Russians engraved by Félix Mixelle and Lachaussée Jeune after Jacques Grasset de Saint-Sauveur. GRASSET DE SAINT SAUVEUR, J. - Femme Tscheremisse [together with] Homme Tscheremisse. GRASSET DE SAINT SAUVEUR, J. - Homme Kamtschadale [together with] Femme Kamtschadale.